The blockbuster news story of the week is that Disney/Pixar’s chief creative officer (John Lasseter) is the latest legend to be accused of sexual harassment. The man responsible for Pixar’s birth, the director of Toy Story, the reason for the current Disney renaissance… likes to give extended hugs, compliment people and enjoys strip clubs. Ummmm, as far as sexual assault stories go, this seems like harassment-lite. I’m not sure what to think of this, in terms of the greater scandal currently destroying the little goodwill Hollywood has left, but I do have a theory to offer: Lasseter is the preemptive patsy for Coco’s probable shortcomings. It’s worth noting that Lasseter hasn’t been fired, which is the immediate reaction of most employers. Instead, he is taking a six month sabbatical. The timing of this news story is also suspect, on the day of Coco’s sneak-preview release. Is this an attempt at free publicity? Highly unlikely. Is this a case of early damage control over the likely scenario where Coco underwhelms at the box office? DING DING DING! You don’t believe me? Let’s go on a journey, my friends, and discuss how the five ways to prep for Pixar’s release are also the five ways to prove Disney might be using Lasseter to deflect attention after Coco fails to set the holidays on fire. After all, it won’t be long before people realize this movie was already made. Today, the year is 2017. It usually takes about three years to make an animated movie. That means the creators of Coco would have started production around 2014. That’s odd because that’s also the year The Book of Life came out. It’s about a young Mexican boy who is told to ignore his passion for music and somehow finds himself in the Land of the Remembered on the Day of the Dead, one of Mexico’s most culturally important holidays. It was created by a master Mexican filmmaker, Guillermo del Toro, and received 82% positive reviews. It had gorgeous 3D animation, lovely music, and tons of humor. It’s a shame it wasn’t a bigger box office hit. It was, however, the apparent muse for Pixar as we now have Coco, a near identical replica of The Book of Life. Sure, you can make multiple movies about the same source material, that’s nothing new. It’s not like Mexico is a one-hit wonder with only one story worth telling, or only one way of telling their most important story. I’m all for inclusion and, given how Donald Trump has trashed the Mexican people over the last year, it’s a perfect time to celebrate our neighbors to the south. But let’s call a spade a spade. Though Coco tells a story many want to hear, it kind of feels more like a box checked off Disney’s racial to-do list. Blatant rip-off aside, let’s look at the numbers. The Book of Life earned about $50 million in the US and $100 million worldwide. $10 million of that was from Mexico. To help promote Coco and possibly as an early way of softening the recent Lasseter blow, Disney has been all over the internet to remind us “Coco is the biggest blockbuster of all time in Mexico!” It currently has about $50 million there. That’s five-times more than Book of Life. If the world reacts to Coco the way Mexico has, as compared to Book of Life, that means roughly $250 million stateside and $500 million worldwide. Those numbers are ambitious but not entirely out of reach. Though doing a movie about Mexico’s Day of the Dead and Disney doing a movie about a non-white culture is nothing new, this is Pixar’s first attempt at both. Pixar loves their white people! Toy Story had a white family; Nemo was held captive by white men; most of the heroes in The Incredibles were white; Pixar’s first princess in Brave was white; the girl in Monsters Inc was white; Up was lifted by an old white man. You see where I’m going with this? Until now, Pixar has been the leading innovator of animation but one of the most culturally backwards creators. After Lasseter helped Disney revamp their animation division with the likes of white princesses in Tangled and Frozen, we finally got a more ethnic computer generated heiress with 2016’s Moana. It was gorgeous, funny, heartwarming and packed full of musical action. But just like Coco, Moana’s stellar reviews couldn’t stop controversy before its release. Disney had a minor marketing blunder with the reveal of insensitive Moana costumes for Halloween but was able to overcome that to become a respectable holiday hit. Can Coco do the same? Disney isn’t new to different cultures or controversy. Pixar is. Disney took elements from the Pacific Islander culture and turned it into a movie about honoring your roots, exploring the world beyond the ocean, and that women can be warriors and leaders just like men. Coco is still about a male but I’ll take the racial half-step in the right direction. Since you can’t really talk about the success or failings of a cultural movie without looking at least a little racist, let’s look at the numbers. Moana is rumored to have cost $150 million. You need three times the cost in worldwide earnings to turn a profit. It opened to $55+ million over three days, $80+ million over the long holiday weekend, earned just under $250 million in the US and $643 million worldwide. It was all much less than Frozen but better than Tangled, and it ended in profit. Pixar’s budgets tend to be higher than Disney’s but I imagine smaller numbers across the board for Coco. Profit is not a guarantee at this point and, sadly, Pixar hasn’t had the best track record recently. Pixar’s first financial flop stomped its way into cinemas with a disappointing $39 million three-day debut. It’s five-day Thanksgiving came in at $55 million. It finally went extinct with a measly $123 million domestic total and $332 million worldwide. There is no excuse for this but, also, no real explanation. The entire Ice Age franchise is built on bad movies making money because dinosaurs are enormously popular around the globe. Jurassic World, anyone? The five Ice Age films have the following averages: $158 domestic total and $643 worldwide. The Good Dinosaur may not have been nonsensical fun for kids like the Ice Age films, but it’s 77% positive reviews bests Ice Age’s 46% average. The real kicker here is the budget difference: The Good Dinosaur’s $200 million price tag vs Ice Age’s $86 million average cost. I point this all out to remind you all that, like Lasseter himself, Pixar is not bulletproof. Maybe The Good Dinosaur failed because Inside Out was also came out a few months prior and one Pixar release a year is enough. If that’s the case, then the disappointing results of Cars 3 from this summer don’t bode well for Coco. I have a feeling Coco’s numbers will more likely reflect Pixar’s dead dino instead of Disney’s lively Moana, but not even Disney can sell every culture. Technically, Disney isn’t bulletproof either. Back when Disney was first guilted into making mass amounts of culturally-diverse movies we got… European white people. I tease because, like the legend of Hercules, I am of Greek heritage. Actually, I’m 100% Greek but second generation American. We consider ourselves more olive-toned than white but I digress. En route to uniting all the colors of the world, Disney gave us a musical version of the classic demi-god. Greeks love gods. 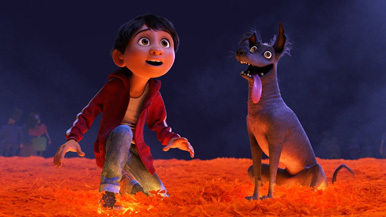 Coco’s mystical Mexican mythology is in line with my Greek interests, and the interest of many other cultures that have similar ways of livening up their history lessons. Disney has many characters from differents parts of the globe but it should come as no surprise that the one I enjoy most is the one that belongs to my people. If you look closer, though, most of the films that target a culture (Hercules, Mulan, Princess and the Frog, Lilo and Stitch) tend to earn much less than Disney’s color-free family fare (Lion King, Beauty and the Beast, Frozen). The problem is that even though we may want to hold hands with everyone in the world, we can’t spend our money on everyone. There’s only so much to go around and some people may skip a feature that isn’t at least close to what their beliefs are. Despite having one of the “top ten limited opening weekend theater averages (adjusted for inflation) of all time” - seriously - Hercules only opened wide with $22 million. It ended with a disappointing $99 million domestically and $252 million worldwide on a $85 million budget. Adjusted for inflation, those numbers jump to roughly $192/491/166 million. It just barely broke even and will forever be remembered as part of the downward trend of 2D animation after Toy Story changed the world in 1995 with computer animation. After Hercules, Disney needed Pixar. Now? Not so much. Maybe I’m getting paranoid and Coco is destined to be a breakout mega hit. I would love to be wrong and I would love for the news reports about Lasseter to be wrong. I wish everyone would show support of all cultures and genders, especially groups that are highlighted in a very well reviewed Disney/Pixar release, but good reviews don’t always ensure success. Maybe the problem isn’t that we are showing another culture; what if the problem is that we’re showing ANY culture? I mean, Coco deals with the Land of the Remembered, which is kind of like heaven for some people. Life and death are very religious concepts. But what if there was a heaven that was void of culture and religion? What would that look like? Defending Your Life is here to answer that question. Written, directed and starring the sarcastic Albert Brooks, this movie basically says heaven is like a giant waiting room between lives where you are put on trial to defend the life you just lived. If worthy, your next life elevates you to a higher existence. If unworthy, you must repeat your life and try again. It’s an insane concept and hilarious movie, as it shows us what a religionless afterlife would be like. No matter which culture is right, it’s safe to say only the highest power in any afterlife can judge us. The fate of Lasseter is not in our hands but Coco’s could be. I’m sure Disney would be thankful this holiday if you could help make their new film a hit. Just remember, if Coco is a success, then your culture could be next!